I don’t normally write about non travel or non event type posts but I feel that I should write about this experience just because I feel it may help someone in the future. As you will have seen by my other posts next year is the world cup in Brazil, with this being the most anticipated world cup since Germany or even before the demand for tickets is obviously at an all time high. As I knew I would be travelling to this event as part of my blog, I decided to apply online via Fifa.com for tickets as soon as the ballot process opened. The process is a simple one really, you add your personal information on to FIFA and select the matches that you want to to be entered in the draw for. As I knew I would be traveling between Sao Paulo and Rio de Janeiro I applied for the maximum number of games allowed, 7. I entered my payment details and I prayed that I would be selected. So since August I have been watching the build up, looking at flights, accommodation and general culture of Brazil. I am now in Colombia and receive an email stating that I must contact my bank immediately. I called and they stated that there has been ‘suspicious activity’ from my card. I asked who it was and low and behold it was FIFA trying to take payment for some tickets. I stated that they should process the payment and unblock it. OK I thought, I have won tickets and they want paying, fair enough. They will surely try again for payment as the tickets are allocated to me right? wrong. Surely someone was winding me up, I felt physically sick for around 24 hours until I have finally come to terms with it and I can now deal with it. So Santander UK decide to block my account because the largest sporting organisation are trying to take payment for the largest event in the world, this is after only 18 months ago the same bank let somebody in THAILAND purchase a television with my card. UNBELIEVABLE. World Cup Tickets go on sale in a couple of days so I will update this post and let you know how I get on, good or bad. Thank you for your interest in the 2014 FIFA World Cup Brazil™ , a unique opportunity to see some of the game’s biggest stars compete in twelve wonderful host cities. 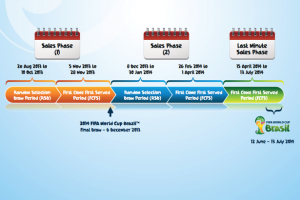 Following your application for Tickets for the 2014 FIFA World Cup Brazil™, your Ticket request was processed by the FIFA Ticketing Centre (“FTC”) and entered into the Random Selection Draw. Unfortunately your Ticket Request was unsuccessful in the Random Selection Draw. Due to the overwhelming demand for tickets which we experienced in the first sales period, with over 6.2 million tickets requested, the Ticket Products you applied for were oversubscribed in the price category you selected. However, there will be further opportunities for you to secure Tickets. 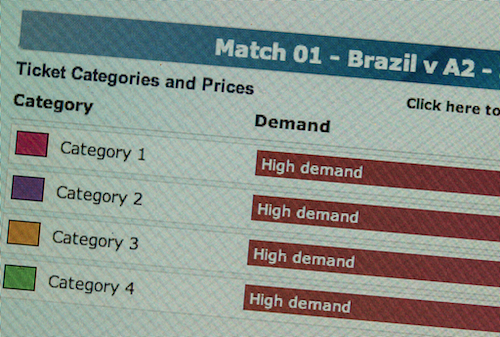 You can apply for Tickets again during subsequent sales phases, subject to availability – your next opportunity will be with the beginning of the first come, first served sales period which will start on 11th November 2013, at 12:00 CET / 09:00 Brasilia time. We would advise football fans to place their order as soon as the first-come, first-served sales period opens as high demand is expected and tickets are likely to sell out very quickly. For further information on Ticket Sales Phases please refer to the information available on www.FIFA.com/tickets or here. If you have any queries, please refer to the Frequently Asked Questions (FAQ’s) at www.FIFA.com/tickets, or by clicking the link on the menu to the left. If you would like to contact us with ticketing enquiries please do so by clicking “Contact Us” on the menu to the left or by phone on 0300 021 2014 for Brazilian residents, or +41 445 831000 for international customers.